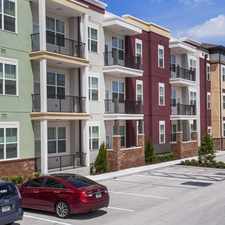 1224 Travertine Terrace has a Walk Score of 3 out of 100. This location is a Car-Dependent neighborhood so almost all errands require a car. Beautiful 3 Bed 2.5 Bath Gated Townhouse for Rent in Sanford, FL! Greystone Subdivision! - Beautiful 3 Bed 2.5 Bath Gated Two Story Townhouse for Rent in Sanford, FL! Enjoy the gated community of Greystone! Open tiled living area. Charming dining nook. Kitchen features beautifully tiled backsplash, breakfast bar and plenty of cabinetry. Upstairs includes a built-in shelf, ideal for family photos or household trinkets. NEW FLOORING ON STAIRWELL AND UPSTAIRS BEDROOMS! Spacious bedrooms with ceiling fans and large closets. Master suite bathroom displays soaking tub and stand in shower. Screen covered lanai with a great lake view.The community is gated with a very nice pool, playground, and exercise facility. Just minutes from Seminole Towne Center, I-4 and the Sanford Airport. Zoned for Region 1 Elementary School, Sanford Middle School, and Seminole High School. Pets are negotiable with owner approval. Professionally managed by Atrium Management please call 407-585-2721 to schedule your private showing. AVAILABLE NOW!!!!!!! Explore how far you can travel by car, bus, bike and foot from 1224 Travertine Terrace. 1224 Travertine Terrace has minimal transit which means it is possible to get on a bus. 1224 Travertine Terrace is in the city of Sanford, FL. Sanford has an average Walk Score of 29 and has 53,570 residents.